We woke up to a cold and foggy morning. We dropped the Pajero off at 8am at the mechanics. By staying the night in Cooma it probably worked out better. We were able to leave the camper in the van park 80% packed up while the Pajero was in getting fixed. While we waited for the Pajero we wandered up the main street and had a coffee at the The Lott Cafe - it is a beautiful rustic cafe & restaurant and is perfect for sitting inside on a cold morning and reading the papers sipping on some hot chocolates. We'll definitely go back again! By 9:30 the temperature was still around 12 degrees and the fog hadn't lifted but the Pajero was ready to go. Luckily I had picked up a complete set of wheel studs in Canberra because the mechanic said that there were one or two other studs that were in a bad way as well. Probably caused by the loose wheel nuts. We were also lucky that there was no other damage to the rim or wheel hub. 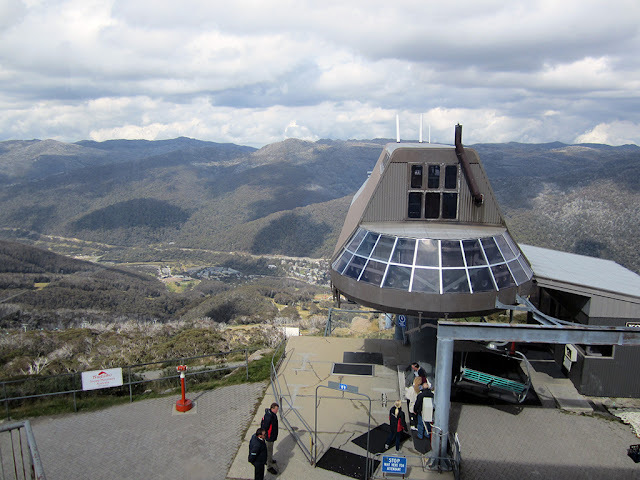 We went back to the van park and hitched up the camper and headed for Crackenback. While going through Jindabyne it was quite obvious that the water level of the Jindabyne dam was still pretty high. You could also see where the water had come to. It had been up pretty high and inundated most of the park land around the dam edges. At Crackenback we were staying in a place called the Pender Barn and The Post Office. It was a couple of places all joined together. There were 6 bedrooms, 4 bathrooms, 2 kitchens, 2 laundries and 2 fire places. It was huge!!!! It could be all be segmented off to make smaller and separate accommodation areas depending on who was renting it. After doing a quick unpack of the van into the house we were off to Thredbo to meet the rest of the gang who had been walking up to Mt Kosciuszko. 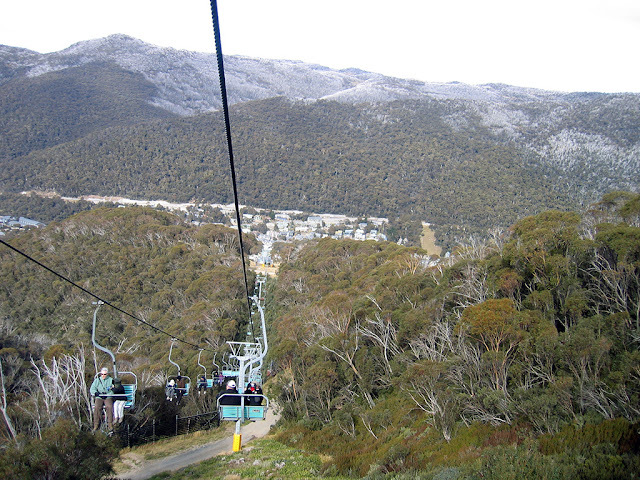 They let us know that they were a few kilometres away from the finish and we arranged to all met at the Eagles Nest restaurant at the top of the chairlift at Thredbo. 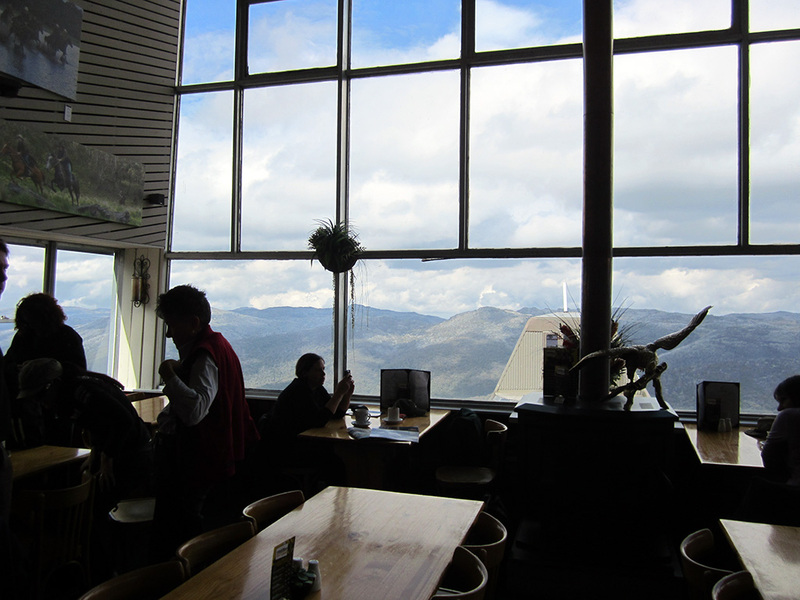 The view from the restaurant is fantastic and would be spectacular, (and probably extremely busy), in the snow season. After lunch everyone headed back to the house to continue catching up with the people that we hadn't see for nearly a year and to prepare for the next day :-) !! !